Our pretty little town has a beautiful park, great trails and along with Lake Runnemede, you really can’t go wrong. We are so fortunate, and if you are a local, you already know this! We are happy to share our experience with you on this beautiful day. Heading down Juniper Hill Road, the newly purchased and renovated Windsor Manson Inn entrance is looking great. They’ve cleared enough so you can easily see the Inn from the road and this change (in our opinion) makes an inviting impression. Do you agree? Wishing them the best and much success! Delaney, as we work our way down the “killer hill” part of Juniper Hill. Our mission today is to view lake side, grab a special pic, then on to Meadow Loop before heading up to the shelter. Entering at Lower Juniper – very pretty – hoping there is a bridge coming up soon. Hooray! The chipmunk didn’t seem to be bothered by us, which is good? North Dike, here we come. For those of you who may not know, Lake Runnemede wasn’t always part of Paradise Park. Our town was able to purchase it from the Evarts Family in 1997. Prior to this, walking across the dike or around the pond at all was considered trespassing, unless of course you had permission from the family. Wait a minute, those pallets look familiar! The WHS Tech ED class rebuilt these pallets to create a walking path, which seem to be working very well. Lilly Pads and Cattails! We love the trail signs! Pumpkin Patch! And – here it is. This is the picture that inspired our walk today. Twin girls looking over Lake Runnemede with Mt. Ascutney in the view. We did it! Ok, back to Meadow Loop and the super cool Gazebo. So pretty! The view from the Gazebo is quite something, showing you beyond the Connecticut River into New Hampshire. Break time is over… Back to the hike! Hello there beaver dam. We made it! At this point, we were tired, hot, thirsty and ready to head home. Once you arrive at the shelter, you can exit the park in many directions. Backtrack across Hubbard Brook, down Zig Zag Trail or head towards County Road. We chose the County Road bridge. Almost home! 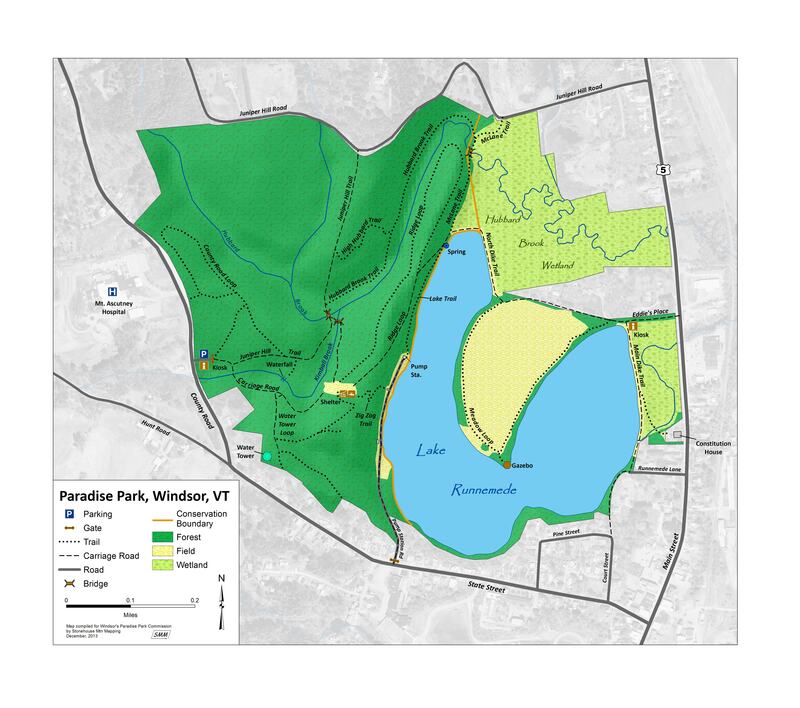 Thanks for joining us – if you are ever visiting Windsor and up for a low key fun hike, we recommend Paradise Park. This entry was posted in Creative Woodworking, Family Fun, Summertime, Windsor, Vermont and tagged Hike, Lake Runnemede, Paradise Park, Twins, Vermont, Windsor. Bookmark the permalink.